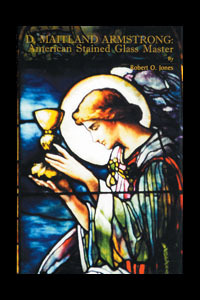 The first monograph published on this major American stained glass artist outlines his life and artistic accomplishments, as well as that of his daughter and business partner, Helen M. Armstrong. Their glass art was considered among America’s finest during the Gilded Age and early 20th century. Important installations included the Appellate Court Building in New York, Vanderbilt’s All Souls Church in Asheville, and The Church of the Ascension in New York. Other installations large and small exhibited the same distinguished artistry and high craftsmanship. Armstrong’s personal friends included notable artists John La Farge, Charles McKim, Augustus Saint-Gaudens, Louis Tiffany, Stanford White, and George Maynard, and Armstrong’s story mirrors the changing cultural landscape of the United States in the 19th century. Extensively illustrated, and researched from private family papers, the book provides a new look at the people, collaborative efforts, and artistic master-works of the American Renaissance.